Ah ha! Didn't anyone tell you curiosity killed the cat? But still, you came to our About Page...curious! Lucky for you, you're human. 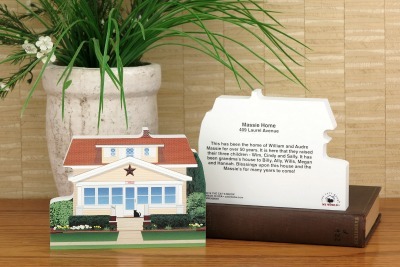 We make little wooden replicas of buildings [including your own home], landmarks, and scenes to help you remember the good times in your life. We design and print the front of our 3/4" thick wood with colorful details, and the back includes written facts or your story. Cat's Meow Village is so named because our black cat mascot, Casper, is hiding on every piece! Crafter-turned-Founder, Faline Jones, has a thing for cats! You buy the Cat's Meows that have meaning for you [including your own home] and display them around your home or office. Rest assured, you are doing business with a woman-owned, pure American company. We're right around the corner in Wooster, Ohio! Hi there, welcome to The Cat’s Meow Village. 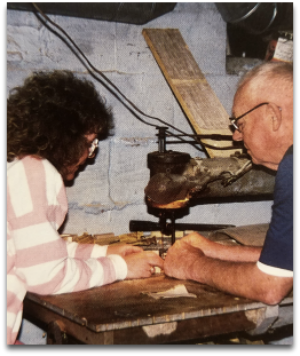 We're a small company birthed in Wooster, Ohio in 1982 from one simple wooden house Faline cut out on her grandfather’s saw in the loft of the hog barn. It’s 36 years later, and Jones with her “crew” continue to craft "little wooden buildings" of local, national, and international landmarks that spark memories and kindle smiles on the faces of “real life adventurers” like you. 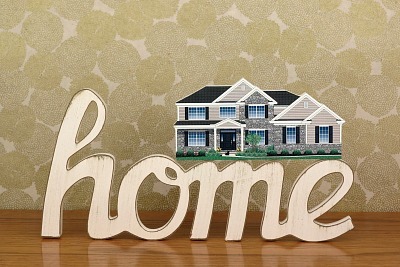 We help you keep memories alive with unique wooden replicas of the places and times you love. Celebrate your favorite places by including our 3/4" thick wooden keepsakes in your home décor. A few favorite spots where Cat’s Meows like to reside are: perched on top of your window and door trim, tucked into your bookshelves, or sprawled across your fireplace mantle. Our Black Cat Daily Blog includes many stories on how “Cat’s Meowers” decorate with the Village in their homes. And what's with the cat? We believe in supporting our community and the ones that surround our Village, both physically and virtually. Faline designs trees for her Charity Grove that don colored Awareness Ribbons. The sales from these trees support various organizations and create awareness of the battles being fought by our neighbors everywhere. Faline has also designated the sales of various Cat’s Meow designs to support specific causes. 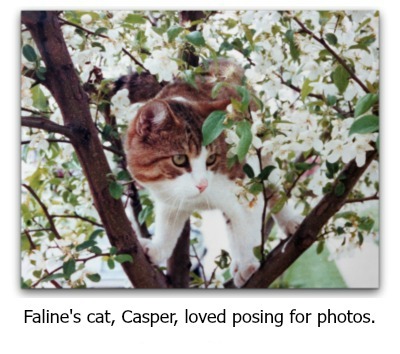 Check out our Rescue Cats, Map Of Africa, and Bible Stories currently supporting causes close to Faline’s heart. If you could pick just one? With so many famous and not-so-famous landmarks around the globe, which one would you say brings a smile and warm memories to mind? Exactly…that’s what we thought…there's too many to pick just one. And our Village reflects the larger world, too, so it can be a little confusing when you first start exploring. Let’s try to break it down neighborhood by neighborhood. Paw through our Search For The PURRfect Cat's Meow magazine to take some of the mystery out of our Village. We’ve saved the best for last! It’s our CATillac! Did you know you can have your very own custom Cat’s Meow created by us? 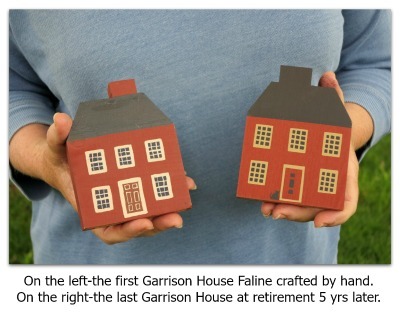 Every day we work with people just like you to craft a keepsake representing your special place in time. With so many memories, there’s sure to be others you want to share a special Cat’s Meow with. How exciting would it be to see a family member’s eyes sparkle when you gift them a keepsake wrapped in love (and gold Casper tissue)? "Hello! I wanted to let you know that I just got my custom-made Cat's Meow of my home and I'm absolutely in love. I'm so excited, it looks so perfect! I can't wait to show it off to family and friends! Thanks so much! 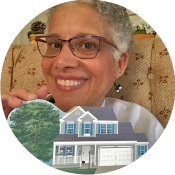 ~Marla S.
Today, our workshop with a crew of 14 enjoy "traveling the world" as we handcraft and ship Cat's Meow replicas of landmarks around the globe. Now what could be better than traveling the world each day while we work? (A) Knowing that real-life adventurers, like you, are enjoying memories of special places when you admire your very own purrsonal Village! 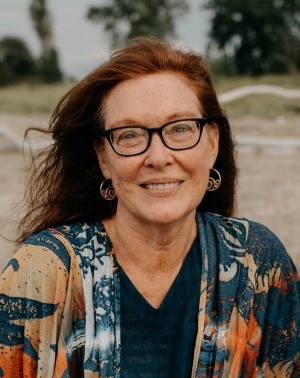 Welcome to Cat's Meow Joan! We are purring with delight that you found us. Make yourself at home as you walk through our neighborhoods! Hi Jacquelyn, The Friendship 7 piece you have should have glitter and glow-in-the-dark ink printed on it. Hold it up to a lightbulb for a few minutes, then take it into a dark room. Look closely, you will find Casper! Faline has designed a few pieces over the years where Casper can only be found when you turn out the lights, and this is one of those pieces. Enjoy looking! Hello, I am one of the granddaughters of Betty Jean Kardas. I inherited her very large collection. I believe she worked at The Cat's Meow for many years. My favorites are the plaques with her name on them, I even have a few with my grandfather's name, Julius Kardas, as I believe he worked there for some time as well. My reason for being here today, I was wondering what the SECOND stamping on some of the houses/businesses means. If you could please let me know I would be so grateful! Thank you for your time! Hello Julia, your grandparents were such wonderful dedicated crew members at Cat's Meow many years ago. They are fondly remembered! You are lucky to have your hands on their Years Of Service Awards! Instead of certificates, plaques or trophies, Faline wanted to use the houses as service awards. So every year, even to this day, crew members receive an annual house with a brass plaque attached engraved with their name and years of service. Regarding your SECOND question... hand screen printing always resulted in pieces that didn't pass the final inspection to be sold in stores, so they would be stamped SECOND and then sold at rock bottom prices several times a year during Seconds Sales. And of course, crew members got their pick of SECONDS any time they wanted. Hi Faline, I have been collecting the Cat's Meow Christmas Village pieces since 1989. My husband was able to surprise me last Christmas with the 1988 Philadelphia Christmas Series and the 1987 Maine Christmas Series which hecwas able to purchase on E-bay. My question is: What year was the first Christmas Series manufactured? Thank you. Did Faline sign any of the buildings? I found a 1991 US Capitol building that is signed Faline '91 Is that possibly for real? Thank you. Faline did sign all her buildings in 1982 to 1983, but by mid 1984 the workshop was getting way too busy for Faline to keep up. That's when we started "signing" with a rubber stamp. Faline would sign her name and year date every year to have new rubber stamps made. Eventually, her name was added during the screenprinting process, and today it continues that way...her signature if part of the production process. However, you may come across houses with 2 signatures on them; those have the production signature along with Faline's real signature that she either signed during a Signing Promo or when I customer would visit the workshop. Desperately looking for the Cat's Meow of the Barberton, Ohio piggery. My granddaughter is getting married there this coming Saturday. If I don't get it in time for the wedding it would also make a great Christmas gift. Thanks for your time! Hi Dora, Yes, we created that building as a Cat's Meow way back 1989! We haven't sold it for many, many years. However, you can order just a single copy of it by going through our Create Your Own Home process here: https://www.catsmeow.com/create-your-own/i-want-create-cats-meow-my-home. I have collected cats meows for all the places my husband and I have lived. We were just relocated to Georgetown Delaware. I can only find a few pre owned cats meow of my new area on e bay. I was told a store did carry them local put closed up years ago. I have called some what local retailers by phone and they do not carry any from Georgetown. Georgetown is he county seat of Delaware. Any help? ? Hi Judy, We've created Cat's Meows over the years for many places across the USA. Unfortunately, many of those stores have closed, just as you experienced. We have a sales rep in Delaware that we will pass your request along to. Hopefully, they can find a new retail store to carry Cat's Meows. Do you ever repair houses that are damaged? What is the best way to clean a piece if there is something on it that you cannot get off with a dry cloth? Thank you. Thanks for asking Kay! It is hard for us to repair houses once they leave our workshop because over time our colors shift in hue or we discontinue using a certain color or process. You can use water on a cloth with a very light rubbing motion. But pay close attention to stop right before the design starts to rub off. We also use the big fat school erasers in the workshop to erase marks. Just make sure you are using a light hand when rubbing the eraser. For any black areas that need touching up, we use sharpie markers and blot it with our finger right after we mark it to take the shine off. Goodluck, just remember to use a light hand in anything you try. Hi, my friend got me into collecting these in the early 90's. I have a Cherry Tree Inn dated 1983 signed by Faline in 1988 & one that I was wondering if it is an original practice piece or a knock off that looks unfinished & merely has Antiques written on the front but looks very similar to the original on your website. Is there a market for selling vintage Cat's Meow? Thanks! Hi Dana, You could possibly have Faline's Antique store Cat's Meow that was also in the same collection as the Cherry Tree Inn. We would need to see a photo to determine that for sure. Her Antique Store has a blue background and an arched sign that says Antiques. The market for vintage Cat's Meows is determined by the buyers and sellers out there. We are not connected to the secondary market as a company. Hope this answers your questions. I just bought two of your buildings from the Belvidere Presbyterian Church in Belvidere, NJ. One was of Hot Dog Johnny's & the other was Belvidere High School. I love them!! The detail on them is great. My package arrived on my doorstep today, and I am thrilled beyond words with the replica of my Alma Mater! I can't believe how much detail was put into it! You all do amazing work, and I am sure some of our other alumnae will be wanting one of these too! Thank you so much for the beautiful memories you create! Can I order more of the school if others want one too? We're happy you're thrilled with your replica! Thanks for sharing your delight. And, we can certainly work with you on ordering more! Thanks for sharing, Cindy! We're overjoyed that you are giving Cat's Meows as gifts. Seems like the purrfect gift choice to us!